Now is the time to think and plan what food will be on the family table. 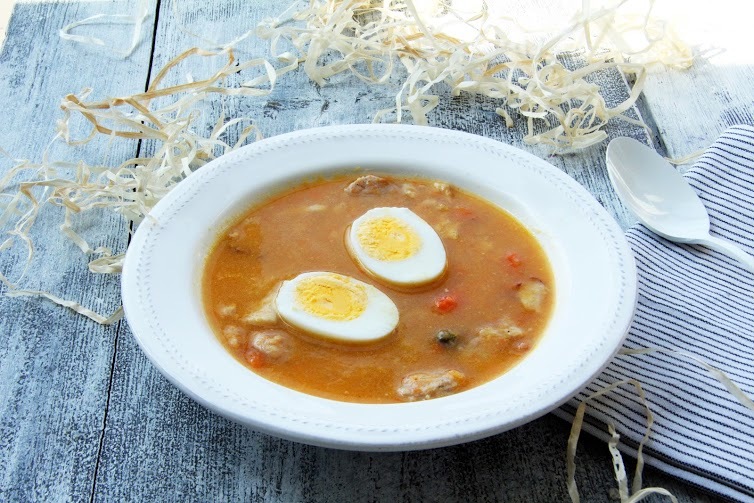 We start with the Easter “must have” a traditional polish soup Zurek. Probably like in most Polish houses I will also serve it during Easter breakfast. My version is cooked on vegetable broth, but without the addition of flour. To the pot of water add peeled vegetables and spices prepared for the broth. Cook until soft, then strain everything. Place diced sausage into the pot with broth, add sourdough leaven and cook for about half an hour, adding bay leaf,marjoram, allspice and chopped garlic. After half an hour add sliced bacon and cook for another 30 minutes. Mix the cooked vegetables from the broth and thicken the soup (instead of the flour). Aded yogurt / vegetable cream and stir. If you prefer a more sour taste – add half a glass of water from pickled cucumbers. I declare an apricot and peach season open now :) I always recommend to eat seasonal and local fruits that’s why today a star in my kitchen is apricot. Goji berries also known as wolfberries are one of the healthiest fruits! Shape body action – day 30! My next all-day menu suggestion. You can add fresh strawberries or other seasonal fruit to your oatmeal for breakfast. SOFT SKIN – SAY BYE, BYE TO WRINKLES!! !